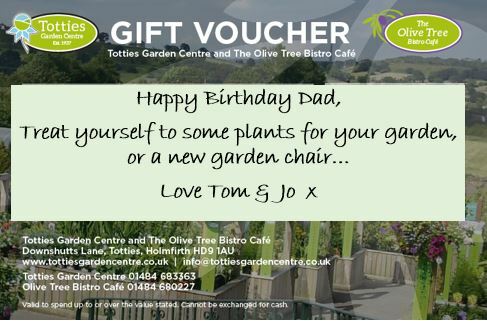 Make a birthday extra special by gifting a seasonal afternoon tea at The Olive Tree Bistro Café. We’ll dress the table before serving up a selection of tasty sandwiches followed by our homemade sweet treats, including scones with cream and strawberry jam and cakes. Also watch out for our seasonal surprises, including mini toffee apples and chocolate dipped strawberries. All this is only £14.00 per person but why not include some fizz with a 200ml bottle of Prosecco for £5.95 (a glass and a half to you and me) or share a standard bottle for £17.95. Gluten free and diary free options are available – booking is essential. 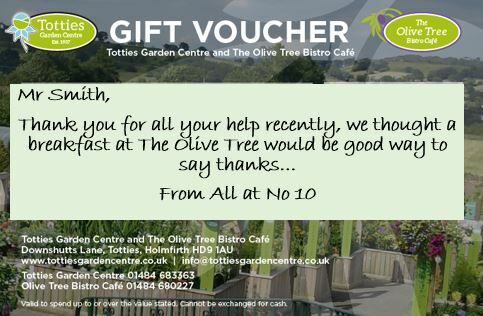 You can pick up gift vouchers at the Garden Centre or order and pay for gift vouchers online or, if you prefer, over the telephone. Simply choose which one and the amount you want to spend, then telephone one of our friendly team who will do the rest for you. Vouchers are valid for 12 months from date of issue. Please call 01484 683363.